MOSCOW, Russia -- Ukrainian military pilot Nadia Savchenko says she feels "OK" despite spending 82 days on hunger strike in prison in Russia. Nadia Savchenko is being held in pre-trial detention in Moscow over the deaths of two journalists. "Sometimes my head spins and I feel sick. But I'm OK... If I still feel something, it means I'm alive." A Russian court rejected an appeal for her to be released on Wednesday. She is awaiting trial over the deaths of two Russian reporters in the conflict in eastern Ukraine. Her case has become the subject of an impassioned Ukrainian media campaign portraying her as a national hero in the fight between pro-Russian separatists and Ukrainian government forces. Her comments come after reports that she was "near death" in recent days - something Russian investigators denied. "This will get me in the end. Sooner or later. Of course it will. "Forty kilograms (88 lbs) means death, and now I weigh 55. I've got 15 to go. But it won't finish me off soon. So don't worry. I will last a bit longer." Since she was captured in June, Ms Savchenko - a fashion designer-turned-air force helicopter pilot - has been elected to the Ukrainian parliament as a member of the Fatherland party, led by former Prime Minister Yulia Tymoshenko. The appeal rejected on Wednesday had asked for her to be freed in order to attend a session of the Parliamentary Assembly of the Council of Europe (PACE). On Tuesday, PACE president Anne Brasseur warned "time is running out to spare the life of Nadia Savchenko". "If for no other reason, the Russian authorities should make a humanitarian gesture to save the life of Ms Savchenko," she said. 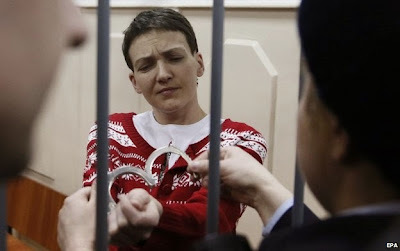 In a cage in Moscow's Basmanny court, Nadia Savchenko looked thin and pale. But she was fully coherent and very spirited. She stood up for a good deal of the court appearance, and to hear the verdict. She followed the entire proceeding, read the documents presented to her and responded to the questions of the judge. Journalists were allowed into the courtroom to hear the verdict. When asked, she said she would not be giving up the hunger strike until there is "justice". Ms Savchenko said she wants to get back to Ukraine to do her duty, and start to work "for Ukraine, in Ukraine. Not to sit around wasting time in Russian prisons". "I always have hope. That dies last. And I am still alive." 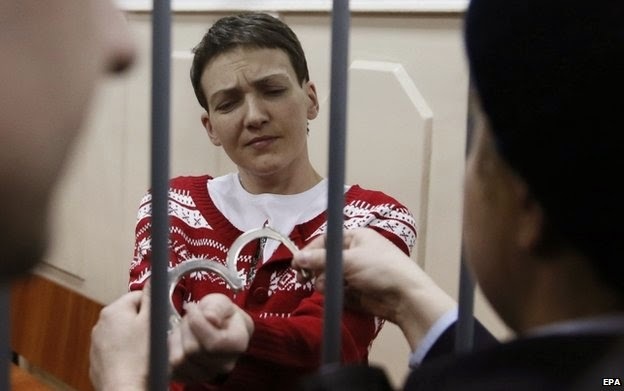 Ms Savchenko has been on hunger strike since December. Her lawyers say in mid-February she began refusing glucose too, only drinking water. Ukrainian President Petro Poroshenko said he had written to Russian leader Vladimir Putin calling for her release on Wednesday. "I have sent a letter to President Putin with an appeal for immediate freedom for Nadia Savchenko, including for medical reasons," he told a news conference after meeting Italian Prime Minister Matteo Renzi. He asked Mr Renzi to raise the "painful" subject when the Italian leader meets President Putin on Thursday, reports say. Kremlin spokesman Dmitry Peskov told Russian news agencies that Putin had not received Mr Poroshenko's letter on Wednesday, and declined to provide any reaction. Ms Savchenko's release had been mooted under the Ukraine ceasefire agreement reached in Minsk last month, which includes prisoner exchanges. But the Kremlin's spokesman later said that no assurances had been given. The Russian authorities have charged her with aiding the killing of two Russian TV journalists in a mortar attack in the rebel-held Luhansk area in June. She is being held in pre-trial detention in Moscow.